Across the withers - 9"
Upper attachments to saddle including snap" 11" to 15"
Withers to center front - 24"
Lower upper elastic attachment from the ring on triangle to saddle - 17" to 21"
Lower attachment from center front to saddle 25" to 30"
Removable Martingale 18" to 19"
This 5-Point Breastplate is padded and elasticized for horse comfort. (Attachment sold separately.) The breastplate is made of the finest English and European leather and has stainless steel hardware. The stainless steel buckles and 1 1/2" rings are brightly polished, strong and rustproof. The leather is made of first quality hides, tanned and curried to look good, accept oil and darken and mellow as you use it. It then is beautifully finished - carefully hand stitched, creased, edged and hand rubbed as English bridlemakers have done for centuries. This breastplate uses only first quality hides, tanned and curried to look good, accept oil and darken and mellow as you use your tack. · It has stainless steel buckles and 1 12" rings – polished, strong and rustproof. Across the withers - 15"
Upper Attachments to saddle 10" to 12"
Withers to center front - 31" to 32"
Lower Attachment from center front to saddle 32" to 35"
with our ergonomically designed “humane” girth. especially when used with “V” billets. Stainless steel dees and roller buckles. Sizes: 44” - 68” in 2” increments. 44" 46" 48" 50" 52" 54" 56" 58" 60" 62" 64" 66" 68"
Our Custom Leather English Girths are made of top quality leather with soft padded center. At one end is premium quality 1 1/2" elastic with 1" roller buckles. The other end has just the two buckles. Hand made in the USA. Sizes starts at 52" and goes up in 2" increments to 72". Colors are BLACK, HAVANA, and CHESTNUT. If the size you need is not listed here, please add the custom size to comments box at checkout. Please allow 4 to 5 weeks for delivery of our out of stock, or custom made girths. Colors - BLACK: 58", 60", 62", 64", 66", 68", 70", 72"
HAVANA: 52", 54", 56", 58", 60", 62", 64", 66", 68", 70", 72"
CHESTNUT: 58", 60", 62", 64", 66", 68", 70", 72"
Our English Nylon fleece or felt backed girths are a huge hit! 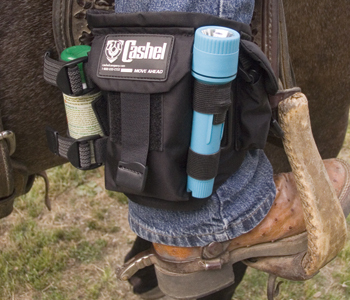 Featuring 1" wide buckles, and elastic on one or both ends to help with a comfortable fit for your draft. Lengths from 54" to 72"
To see most of the fleece options click on "Click to see Fleece and Quilt Options" above on the left side. Our nylon products are custom made and take 2-4 weeks to receive, if you need something right away please call to find out what we have in stock. We have a double ended black nylon black fleece, size 66 inches in stock. The English Fleece Tush Cushion has 1/2" of Cashel closed cell foam (will not collapse like open-cell foam) covered with the fleece to the edges, with adjustable nylon straps to hold it firmly in place. It will not bunch up or absorb heat for a smooth balanced seat, for hours of comfort. 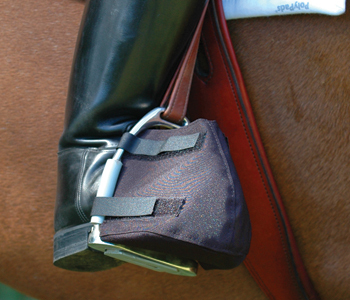 Safety minded riders love the discrete 12½” long rounded strap which attaches to falldown staples for security. Antique, Black, and Havana. STRAP 210 A great addition to any non-horn saddle, this strap can be added for people who still want something to hold on to. It also makes a great carry handle, and can also be used as a general utility strap. Works with most dressage saddles. Even sizes 30" to 54". 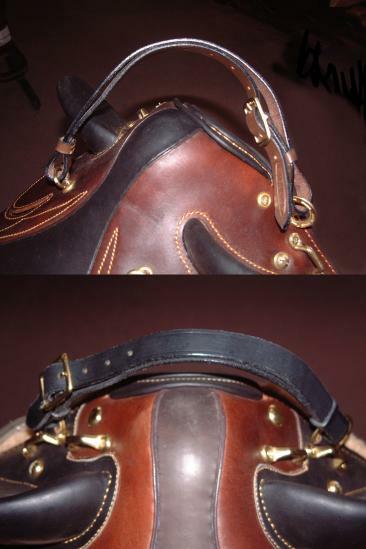 Girth width: 4 inches, inside buckle width: 1 inch.